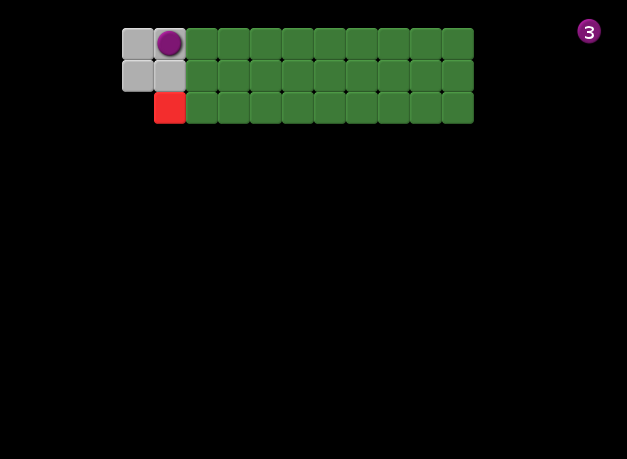 The goal in the game is reaching the red square after getting all the green squares. If you go into black, you die and if you reach the red square without collecting all green squares, you die. Yellow squares teleport you to the next yellow square. Dark green squares require getting over them twice to be collected. Oh, I almost forgot, after started moving you can't stop. This game is a prototype, and if enough people like it, I'm planning to make it into a better and longer game. So, if you play the game, please give feedback. Thank you! One Way To Go is open source. If you want to see the source, just download onewaytogo.love, rename it to onewaytogo.zip and unzip it. A LÖVE file is actually a renamed zip archive. Win32, Win64 and Mac OS X downloads include the required binaries. But if you run Linux, you'll need to install LÖVE (love2d) on your system to run the .love file. I just so happened to see one of your games pop up and saw that you were doing a game a day so thought I'd play through them. I was expecting something shorter but I've been playing/failing for an hour and really enjoying it. The puzzles feel flexible enough that there can be multiple solutions (making you feel clever for working a way out rather than just understanding what the designer had planned). Replaying levels doesn't feel repetitive - it feels more like you are honing your skills. The longer you go on the more solutions you have to keep in your head. I don't think it would feel the same if you restarted the level again after each death. Some really nice callbacks to previous puzzles with different mechanics layered in. The one thing that did get a little frustrating was the detection for being "off" an edge did feel a little unforgiving at points but other than that. Good Job! Hi, Marcamillian! Your point is valid I think. I thought about making the collision with black more forgiving by making the collision box smaller, and I thought about making the movement grid-based, like in hexa-gone, if you played it. I have to think about it. Thanks a lot for the invaluable feedback!